The Oconee County Board of Commissioners last (Tuesday) night agreed to put a bid of $92,000 for demolition of the Old Jail located behind the Courthouse in Watkinsville on the agenda for final action at its Nov. 7 meeting. County Administrator Justin Kirouac recommended that the Board accept the low bid from Complete Demolition Services Inc. of Carrollton to allow for both security and space upgrades to the existing Courthouse. Commission William “Bubber” Wilkes refused to allow the item to go on the consent agenda, meaning that it will be up for discussion when the Board next meets on Nov. 7. In other action, the Board gave tentative approval for a $238,490 contract with Kevin Price Construction, 2500 Daniells Bridge Road, for construction of a new fire station at an undisclosed location to replace the Barber Creek Fire Station on the Oconee Connector just south of SR 316. The Board also approved tentatively contracts for construction of three multi-use sports fields at Veterans Park and for replacement of the carpet in the Brannen Building at Herman C. Michael Park. Both Parks are on Hog Mountain Road. The county has been discussing demolition of the Old Jail since July. The jail, built in 1905, is unused and occupies space at the northern, rear corner of the Courthouse. The plan is to expand the existing Courthouse into the area now occupied by the Old Jail to accommodate space needs and security needs for the Courthouse. Wilkes has been opposed to tearing down the building, which he says has historic value and should be preserved. Because of Wilkes’ objection, the Board did not put the item on the consent agenda for the Nov. 7 meeting. Consent items are passed as a group without further discussion. The current station is unable to house a ladder truck, and the new facility would be constructed to accommodate such a vehicle. In August, the Board of Commissioners rezoned the 2 acres on which the Barber Creek Fire Station is located for business use in preparation for selling it to someone for development. The Board has not publicly identified a location for the new fire station, but it went into executive session after the meeting on Tuesday to discuss land acquisition, personnel matters and litigation. Board of Commissioners Chairman John Daniell told me before the Board adjourned into executive session that he expects to make an announcement at the Nov. 7 meeting on the site selected. The Board put approval of the contract with Kevin Price on the consent agenda. She also recommended that the Board accept the bid of $16,188 by Smith and Company of Monroe to replace the carpet in the Brannen Building. Both projects will be paid for with Special Purpose Local Option Sales Tax Funds, though the Brannen money will come from the general county facilities category while the multi-use fields money will come from–and exhaust–the 2015 SPLOST monies for Parks and Recreation. In other action involving Veterans Park, the Board approved a resolution requesting that the U.S. Army provide a piece of military equipment to the county through its Army Static Display Program for a permanent exhibit at Veterans Park. Commission Chairman Daniell said the Oconee Veterans Memorial Committee wants to obtain a retired helicopter and will cover the $10,000 in cost the county is pledging in support of the project. All three items involving the parks were approved for the consent agenda for Nov. 7. 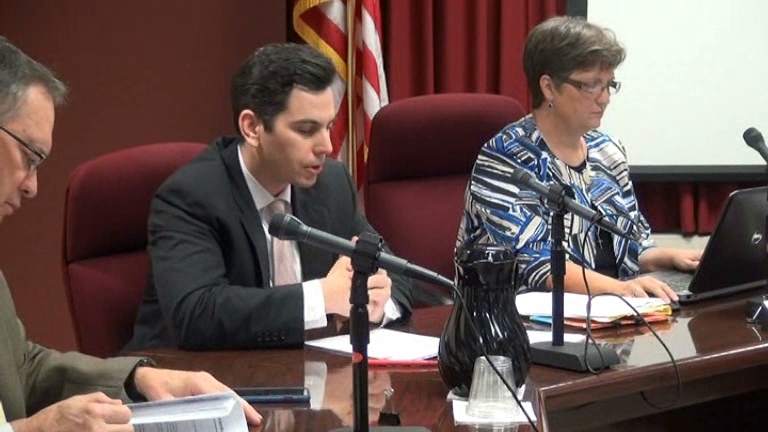 The video below is of the complete meeting of the Board of Commissioners in the Commission Chamber in the Courthouse in Watkinsville. Discussion of demolition of the Old Jail begins at 14:08 in the video. Discussion of the construction contract for the new Fire Station No. 8 begins at 15:53. Discussion of the two Parks and Recreation Department projects begins at 8:05 in the video. Discussion of the military equipment for Veterans Park is at 17:51 in the video. OCO: BOC 10 24 17 from Lee Becker on Vimeo. Tearing down history for convenience in some kind of Courthouse remodeling, which so far has only been discussed as a future project. There is a way to keep what is clearly a historical building with the internal revamp. Meanwhile, we can't even use the front door of our own Courthouse for some kind of mysterious "security risk." This is an irreversible mistake.